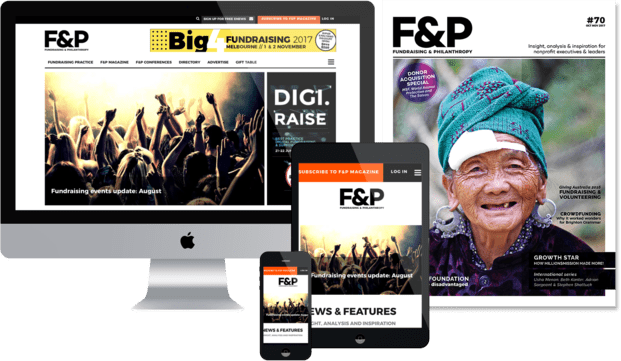 Fundraising and Philanthropy Magazine (F&P) aims to help charity and nonprofit organisations do their fundraising better. It’s as simple as that. The philosophy behind our content is that it must be practical and actionable, and it must provide that injection of ideas and inspiration that we all need from time to time. F&P provides commentary and analysis on issues and emerging trends, fundraising case studies, giving news, professional development opportunities, articles on fundraising best practice, fundraising strategy, thought leadership, interviews with sector experts and much more. The magazine is for managers and executives working in fundraising, marketing, communications, and philanthropic roles. It’s also for charity and nonprofit leaders such as CEOs and board members. four industry leading conferences a year covering most of the key fundraising methodologies.